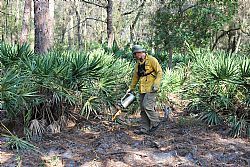 The Land Management Section of the Southwest Florida Water Management District will be conducting prescribed burns during the months of March, April, May and June on Deer Prairie Creek Preserve and neighboring Schewe Tract. Deer Prairie Creek Preserve, which is jointly owned and managed by the District and Sarasota County, is located between Interstate 75 and US Highway 41. The Schewe Tract, which is located south and north of Interstate 75 just north of Deer Prairie Creek, is fully owned and managed by the District. Both of these parcels are located west of North Port. Approximately 1200 acres will be burned in small, manageable units. According to Will VanGelder, the District’s land management manager, burns are implemented to mimic natural fire cycles under a controlled situation. The objective is to avert uncontrolled wildfires and enhance the area’s natural conditions by maintaining the ecological and wildlife habitat values. Prescribed burns are only conducted when weather conditions are optimal to meet the desired objectives and to minimize impacts to the public.